MLB Nassau Stand Bag (Select Teams Available) - $117.95 - GolfersEdgeOnline.com - Best Golf Equipment On The Web! 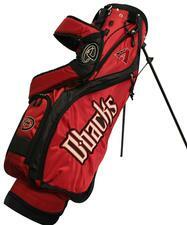 This lightweight carry bag is designed in team colors with five embroidered team logos. The padded dual strap makes walking a round of 18 a breeze, while the easy to use stand system allows you to choose your club and swing away quickly. If you have any more questions about the MLB Nassau Stand Bag (Select Teams Available); do not see the model you are looking for; need custom options; or prefer to not purchase online, then please call us at (630) 656-1291.